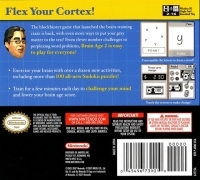 Box Text: Flex Your Cortex! The blockbuster game that launched the brain-training craze is back, with even more ways to put your gray matter to the test! From clever number challenges to perplexing word problems, Brain Age 2 is easy to play for everyone! - Exercise your brain with over a dozen new activities, including more than 100 all-new Sudoku puzzles! - Train for a few minutes each day to challenge your mind and lower your brain age score. 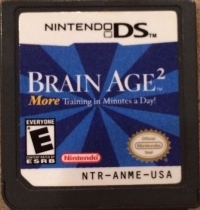 02-09-2018 aliensstudios Name Brain Age 2: More Training in Minutes a Day! 04-26-2016 desocietas Box Text Flex Your Cortex! The blockbuster game that launched the brain-training craze is back, with even more ways to put your gray matter to the test! From clever number challenges to perplexing word problems, Brain Age 2 is easy to play for everyone! - Exercise your brain with over a dozen new activities, including more than 100 all-new Sudoku puzzles! - Train for a few minutes each day to challenge your mind and lower your brain age score. This is a list of VGCollect users who have Brain Age 2: More Training in Minutes a Day! in their Collection. 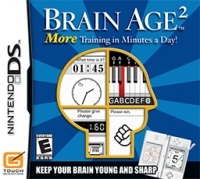 This is a list of VGCollect users who have Brain Age 2: More Training in Minutes a Day! in their Sell List. This is a list of VGCollect users who have Brain Age 2: More Training in Minutes a Day! in their Wish List.